Prime Minister Benjamin Netanyahu’s office announced Monday it would not extend the mandate of the Temporary International Presence in Hebron, an international observer group, following a number of incidents over the past year in which its members scrapped with settlers in the flashpoint West Bank city. “We will not allow the continuation of an international force that acts against us,” Netanyahu said. Israel announced that it will not renew the mandate for a group of international peace monitors stationed in Hebron. The UN-affiliated Temporary International Presence in Hebron (TIPH) has been stationed in Hebron for more than 20 years. Denmark, Norway, Switzerland, Sweden, Italy and Turkey have contributed civilians to act as monitors on the ground in Hebron since the organization’s establishment in established in 1994 following the Tomb of the Patriarchs massacre, during which Baruch Goldstein killed 29 Palestinians at the holy site. 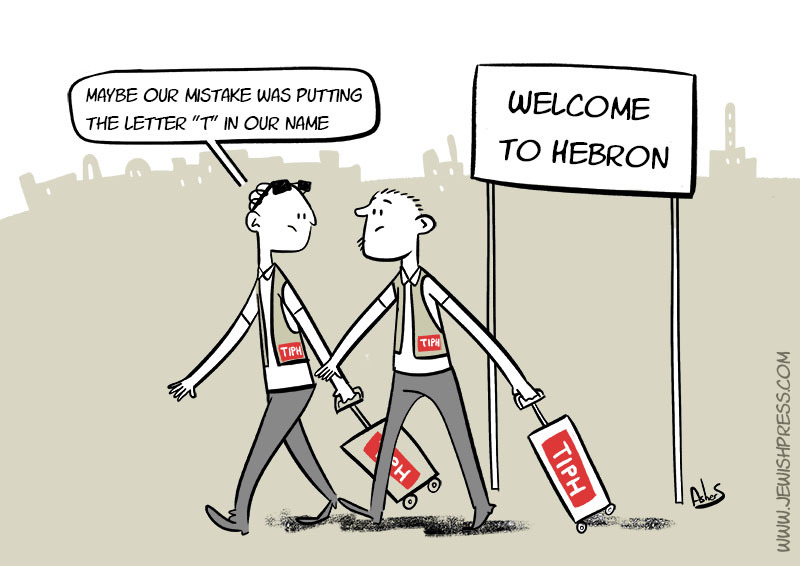 Because the Hebron monitors’ mission was originally meant to be “temporary,” its mandate had to be renewed twice a year by both Israel and the Palestinian Authority. The announcement to send the Hebron monitors packing was picked up the three main international wire services: Associated Press, Reuters and Agence France-Presse (AFP) — none of whom shed any light on the questions of why. So why are the Hebron monitors no longer welcome? Why is this happening now? Reuters and AFP cited vague Israeli accusations of TIPH bias but reported that the Prime Minister’s announcement didn’t offer any reason for the move. AP’s four-paragraph piece didn’t even say that. You’d think the nasty Israelis booted out the observers for no good reason. The fourth time was the charm as the U.S. Senate finally cleared a major procedural hurdle on Monday evening to vote on a bill on Republican-introduced legislation that, if enacted, would impose fresh sanctions on Syria, boost security cooperation with Israel and Jordan, and attempt to tackle the anti-Israel BDS movement domestically. In comparison with the behavior of its neighbors, Israel still looks pretty good. Between Syria's Assad, Lebanon's Hizbullah, the mullahcracy in Iran, Hamas in Gaza, and even aspects of Abbas' Palestinian Authority, particularly its pay-for-slay and the martyrs' fund, there aren't a lot of democrats or human rights champions. Getting points for not being Assad isn't such a compliment. But let's be clear. In the wake of the Arab Spring, the rise of Islamic State, the Syrian civil war and Assad's use of chemical weapons, the gap between Israeli behavior and that of key actors in the Arab world on the violence/terror scale is only growing. From the standpoint of the vast majority of U.S. politicians and officials, the case for a strong relationship with Israel is still pretty easy to make. With all its imperfections, Israel remains the only country in a violent and dysfunctional region where there is any evidence of a shared alignment of both values and interests with the U.S. I can't tell you how many memos I wrote in the 1980s arguing that the Palestinian issue was central to regional stability and the protection of U.S. interests. But today, a rising Iran, the dangers of nuclear proliferation, the emergence of the jihadis, the melting down of at least three Arab states (Yemen, Libya, Syria), and internal challenges to others have not only pushed the Palestinians off center stage, but created increasing exhaustion and frustration with the Palestinians themselves. The factors supporting a continued U.S.-Israeli relationship are strong: the influence of traditionally pro-Israel organizations; support for Israel among large numbers of Evangelical Christians; the enduring power, still, of a Democratic party that sees little profit in blasting Israel; the reality that the vast majority of elected representatives in the House and Senate aren't sent to Washington to deal with the Israel issue; and there's still a political price to be paid for criticizing Israel. Until I see a genuine debate in the House and Senate on Israel with large numbers of members taking positions that would have been unthinkable in previous eras, count me as yet to be persuaded. German Chancellor Angela Merkel told Israeli public radio that it was "important and right" that Israel defends itself from Iranian forces in Syria. "Iran has policies that are threatening to Israel," Merkel told Kan Reka radio. Asked about recent Israeli airstrikes against Iranian targets in Syria, she said "Israel must secure its existence." Germany was also working to ensure that Iranian forces do not approach the Golan Heights near the Israeli border, she added. Israel, which rarely comments on its military operations in Syria, admitted last week that its warplanes had struck elite Iranian troops in Syria. After the strike, the head of Iran's air force reportedly said his soldiers were ready to "wipe Israel off the Earth." Israel fears that Iran, which, along with Russia, is allied with Syrian President Bashar Assad, could build up a military presence near its border. The Palestinian ambassador to the United Nations said Monday that the day will come when "obstacles" in the Security Council to full U.N. membership will be removed "but that day is not today." The main hurdle is the United States, a veto-wielding Security Council member that insists the Palestinians only gain full membership in the United Nations after negotiating a peace deal with Israel. "We disagree with them on that," Ambassador Riyad Mansour told a group of journalists. "We believe that our statehood, and our admission, is an innate right for the Palestinian people … to exercise it alone. It is not open for negotiation with anyone – nor will we ask for permission from anyone." Mansour said the legal right for Palestine to become a full member of the United Nations was formalized in the 1947 General Assembly resolution that partitioned British-ruled Palestine into "independent Arab and Jewish states." Israel was accepted as a U.N. member, he said, and Palestine "will continue fighting for that right." The Palestinians initially had observer status at the U.N., but in 2012 the 193-member General Assembly raised their status to an "observer state," giving the Palestinian Authority a green light to join international organizations. Earlier this month, the Palestinian Authority became chair of the largest voting bloc at the U.N. – the 134-nation Group of 77. The Defense Ministry on Tuesday declared that an Israeli man beaten to death two years ago was a victim of terror, reversing two previous decisions that did not grant such recognition. David Bar-Kapara, a resident of Rehovot, was fatally beaten near Pedaya, a village in ventral Israel, in 2015 by two West Bank Palestinian cousins. Police and the Shin Bet security service determined that the cousins set out to rob Bar-Kapara because they believed he was wealthy, but his family has always insisted it was a terror attack. Bar-Kapara’s recognition as a terror victim means his family will be eligible for benefits. Vandals broke into a synagogue in the Jerusalem neighborhood of Kiryat Yovel overnight Monday and damaged the prayer house, throwing Torah scrolls and other Jewish artifacts onto the floor. Levy, who serves as a lay leader for the Siach Yisrael French-speaking community, said there was no friction between worshipers and people outside the community, adding that there are no security cameras located nearby. Many members of the community are French immigrants to Israel, Hadashot TV news reported, saying they had left France to escape anti-Semitism and felt they were now experiencing it in Israel. Police said in a statement that a forensic team was immediately sent to the scene and an investigation into the incident has been opened. They later announced the formation of special task force to investigate the attack. Prime Minister Benjamin Netanyahu issued a statement saying he was “shocked” by the attack, adding that he hoped the perpetrators would soon be caught and brought to justice. The new Israeli political party Yashar has developed a first-of-its-kind mobile app to facilitate communication between party members and their Knesset representatives. Bills submitted to the Knesset will be loaded onto the app so that party members can decide whether to vote yay or nay. Party members vote via the app, and the party's representatives will cast their ballots in the Knesset in line with the result of the app vote. Yashar is one of several new parties to join the crowded field in the upcoming Israeli national elections. "The party presents a liberal democratic platform, including a comprehensive regional framework for the resolution of the Israeli-Arab conflict," Yashar party advisor Ran Fadut told The Jerusalem Post. Hamas said on Monday that attempts by its rivals in Fatah to form a new Palestinian Authority government will deepen the crisis between the two parties and deal a severe blow to efforts to end divisions among the Palestinians. On Sunday, the Fatah Central Council recommended that PA President Mahmoud Abbas form a government consisting of representatives of various PLO factions and independent figures. The government will replace the one headed by Prime Minister Rami Hamdallah. Mahmoud al-Aloul, deputy chairman of Fatah, said his faction has formed a special committee to negotiate with various Palestinian groups about the formation of a new government. Hamdallah’s Ramallah-based cabinet is called the Palestinian National Consensus Government because it was established following understandings reached between Fatah and Hamas in 2014. Fatah leaders said that in the wake of the continued crisis between their faction and Hamas, there was no point in keeping the present government in power. Some Fatah officials are also dissatisfied with the performance of Hamdallah and say they would like to see one of them replace him as prime minister. Although he is affiliated with Fatah, Hamdallah – who previously served as president of An-Najah University in Nablus – does not hold any official position in the faction. Fatah officials also believe that since their faction is the largest group in the PLO, it should have a strong presence in any government. On Monday, Hamdallah signaled his readiness to step down any time he is requested to do so by Abbas. Palestinian Authority Prime Minister Rami Hamdallah tendered his resignation on Tuesday, a spokesman said. “He and the rest of the government ministers resigned,” Ahmad Shami, one of Hamdallah’s spokesmen, told The Times of Israel, adding that PA President Mahmoud Abbas would now have to decide whether to accept their resignations. Hamdallah’s decision to submit his resignation came two days after the Fatah Central Committee recommended the formation of a government made up of representatives of factions in the Palestine Liberation Organization and independent personalities. Shami said that if Abbas accepts their resignations, Hamdallah and the other PA ministers would continue to serve until the formation of a new government. Hamas spokesman Fawzi Barhoum condemned the PA government’s resignation, saying it was aimed at paving the way for the establishment of “a new separatist government” that serves Abbas and his Fatah party’s interests. Fatah Central Committee Member Azzam al-Ahmad said on Sunday that the Palestinians planned to form a new government in response to Hamas not handing over the Gaza Strip to the PA.
TRANSCRIPT: Terrorist murderer Karim Younes' mother: "He [Karim Younes] is the one that strengthens my endurance: 'Mom, I didn’t do [anything wrong] – I didn't steal. I didn't harass a woman. I did nothing for you to be ashamed of. On the contrary, mom.' He always encourages me… I told him: 'Don't worry... You did nothing wrong.' ... [To all his fellow prisoners I say:] 'Don't despair and don't worry. You did nothing wrong that harms your families or [causes] them to be ashamed of your actions. On the contrary, you bring us pride. '” Official PA TV reporter: "By becoming a symbol of adherence to the [Palestinian] cause and the land, he has turned into a source of pride for his town 'Ara within the Green Line, and to all of Palestine." [Official PA TV News, Jan. 6, 2019] Karim Younes - Israeli Arab serving a 40-year sentence for kidnapping and murdering Israeli soldier Avraham Bromberg in 1980 together with his cousin Maher Younes. Younes was originally sentenced to life in prison, but Israeli President Shimon Peres reduced his sentence in 2012. In May 2017 Younes was appointed by PA Chairman Mahmoud Abbas to the Fatah Central Committee. TRANSCRIPT: Sheikh Osama Al-Tibi: "These are the Jews who haven’t changed throughout history… These are the Jews who expose their fangs whenever they get the chance. They are causing devastating corruption throughout the land… We must mention… the truth about these Jews, which Allah wrote in his book [the Quran] Among the Jews’ characteristics is that they have offended Allah... They murdered the prophets.... They strove to kill Prophet [Muhammad]… Another characteristic is that they are cursed, and they have been denied Allah’s mercy… And among their vile characteristics is that they have breached contracts, conventions, and agreements. 'So for their breaking of the covenant We cursed them' [Quran]. 'And made of them apes and pigs and slaves of Taghut' [Quran]. These are the Jews… Always fighting, always corrupting, always scheming, and always plotting against humanity – not just against the Muslims, but rather against all humanity… And another characteristic is that Allah has imposed on them humiliation and misery… So how did Allah curse them, the Jews at the time of Prophet [Muhammad], since these things [sins] were done by their ancestors? The [Quran] commentators explained: … these malignant genes and cursed characteristics continue in them. They transfer them – Allah save us – from generation to generation. They inherit it from father to son… Humanity will never be able to live together with them. And that’s why, my brothers, even Europe, America, and others have spit them out, down to the last one… Our prophet [Muhammad] informed us [that] at the end of time the Muslims will fight the Jews until the Jews hide behind a stone or a tree… The tyranny of the Jews did not just reach humans, but also the inanimate objects and all creatures: 'Until the Jews hide behind a stone or a tree, and the stone or a tree will say: 'Muslim, servant of Allah, there is a Jew behind me, come and kill him' ... Allah, strike your enemies, the enemies of the religion, count them and kill them one by one, and do not leave even one." Hamas on Monday said Egypt will briefly open its border with the Gaza Strip in both directions for the first time in three weeks. The Rafah crossing will operate for three days starting Tuesday, Gaza's Interior Ministry said in a statement. Egypt has kept the crossing shut for outbound Palestinians since the Palestinian Authority withdrew its forces earlier this month in a dispute with Hamas. The Islamic terrorist group seized power in Gaza in 2007 but allowed the Western-backed Palestinian Authority to operate the crossing in a 2017 reconciliation agreement that has since unraveled. Rafah is the main gate to the outside world for the Gaza Strip's 2 million residents. Iranian hackers target Israel every day, Prime Minister Benjamin Netanyahu charged at a cybersecurity conference in Tel Aviv on Tuesday. Israeli officials have long accused Iran of seeking to hack important systems, as well as voiced concerns that it could try to meddle in the April 6 elections. The Islamic Republic has also been named by other Western powers as a rising force in cyberwarfare. In his Tuesday speech, Netanyahu also hailed Israel’s cybersecurity experience and general technology prowess, saying they created diplomatic inroads for the nation. “Every single county is talking to us about cyber,” Netanyahu said. On December 19, Prof. Sebnem Korur Fincanci, president of the Human Rights Foundation of Turkey (TIHV), was sentenced to two and a half years in prison for being one of 2,212 signatories to an "Academics for Peace" petition in 2016. The petition called on the Turkish government to cease its violence against the Kurds in southeastern Turkey. Fincanci is one of 429 academics who, as of December 19, have stood on trial since December 5. Erdogan was not telling the truth when he declared that everyone in Turkey would enjoy "freedom of faith, freedom of thought and freedom of opinion." In fact, Turkish jails and prisons are so packed with people imprisoned for expressing their beliefs, that the government just announced it will be building 228 more prisons over the next five years to accommodate the overflow.